My problem started when my backwash hose broke during backwash and the pump/motor got wet and shut off. Now I need to determine how much of the pump/motor can I save and if I can fix any part. The motor is 1HP Emerson EST1102, attached to hayward SP3007 pump body. I have reset the circuit breakers at the house multiple times and the pool pump kills it every time I start it. There is no humming from the motor or the pump. I can hear a click immediately after I flip the switch. I see no sparks. The optimistic scenario would be that I just need to open the motor up and blow dry and hope it works. Would the worst case be that I have to change the complete pump and motor? Worse case the motor, but not the pump. Sorry if this is a dumb question, but do you think the motor was fully dried out before a re start attempt? But you can try and save the motor you have. Best bet is to kill the power and disconnect everything from the pump. Take it into the garage. Pull the back cover off and separate the motor from the pump. Grab the hair dryer from the bathroom (or space heater with a fan) turn on to low heat and have it blow warm air thru the motor as best you can for a couple hours. You have to get all the moisture out of the windings. Hopefully there is no permanent short or breakdown of the varnish. Since you've tried to run or it was running it in it's wet state there's a chance it could have permanent arc damage. I don't get it. Many thousands of pool pumps are outside and I think all are made to operate out there........did the pump get flooded? Were you there when the backwash cycle began? 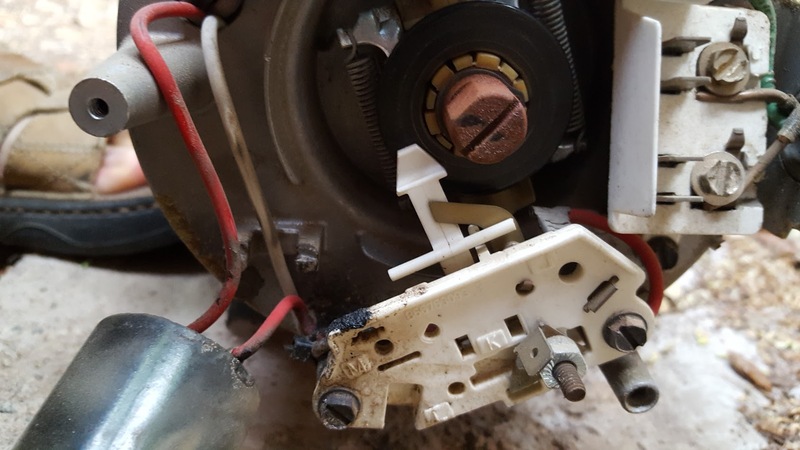 Outdoor "splash proof" rated motors, the majority of pool motors have this rating, won't take well to having a backwash hose squirting into the air vents. They are designed to handle damp air and splashes from rain. By the sounds of what was described a large volume of water was directed forcefully into a running motor by the broken backwash hose. That's not something this type of motor is designed to handle. No I don't think the motor was dry. I thought it was just a breaker tripping, so I tried to restart the pump after resetting the breaker. The backwash hose was going out to the yard, so I was watching the exit of the hose. When the hose broke at the connection to the valve, it filled the area around the filter and pump with water for about a minute. I opened the motor and I saw burnt marks. The shaft turns freely with hand. I'm not sure what the burnt wires are. What does the white plastic markings of M, L, K mean? The capacitor looks ok. The white piece looks like the capacitor cutout switch. By the looks of it I doubt that capacitor is ok. That's a pretty significant burn mark there. I replaced the capacitor and no improvement. It still trips the main breaker. The one with two switches connected that I have to flip. I read about the GFCI breakers. Are those the same things? I looked for GFCI and didn't see one next to the pump motor. I only have a flipswitch similar to a light switch. How do I further narrow down which circuit is tripping the main breaker? tFrom the looks of the burned wire, I would say the pump got submersed.....not splashed. I think a new moto might be the best option.